Welcome to Almost Frugal! Thanks for stopping by. If you enjoy this post, why not subscribe to my feed, by RSS or email? This is my youngest son, Owen. He’s pretty cute, isn’t he? But maybe getting a little scruffy around the edges. Let’s give him a haircut. First, you want to get their hair wet. You can hose them off in the shower, use a spray bottle, or if the spray bottle doesn’t work, just dump water on their head. Then comb their hair to get all the knots (and curls) out. The next step is to cut the hair at the nape of the neck to the desired length, using a comb as a guide to get a nice straight line. 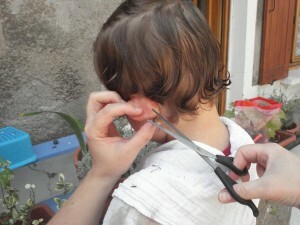 Then you want to cut the hair on the sides and around the ears, making sure not to cut their ear! Finally, cut where the sideburn would go, in front of their ear. I like to cut on an angle, starting at about the middle of the ear and angling back towards the top. Now that you have a nice straight line around the outside, you can start with the inside. The trick to doing a good haircut (my definition of a good haircut is when you can’t see the mistakes) is to hold your fingers vertically when cutting, and cut vertically as well. Then you won’t see any lines from side to side. So, holding your fingers vertically, start cutting. For the lower third of the head I cut one fingerwidth from the scalp. From the ears to the crown and the top of the head, I cut about two fingerwidths from the scalp. For the top of the head, I cut about three fingerwidths from the scalp. Now just keep cutting and trimming, and cutting and trimming until you get the desired effect. Remember, you can always cut more off! But cutting less off? That’s called ‘waiting for six weeks for that slip of the scissors to grow out’. Et voila! He likes his new haircut. I cut my boys’ hair every three to four months and my husband’s hair every two months or so. When my daughter gets enough hair for me to cut, I’ll cut hers too. At â‚¬18 a haircut (the bare minimum here) we save â‚¬216 a year. Not too shabby! How do you manage haircuts? Do you cut the hair of your family members? Who cuts your hair? He sure is a cutie! Great job on the haircut! yes, really good job! Yet, I can’t show this to my husband because he thinks I should do all the haircuts. I just have NO desire to cut hair – not one bit. So, instead we go as little as possible. And, really a hair cut is my only real “treat” thing I do. No manicures, pedicures, facials, massages for this girl only hair cuts. LOVE this post. I won’t be needing to cut my daughter’s hair for a few years, but Owen is so darn cute!!! What a sweet little boy! Those curls are too cute. I don’t think I will be bringing scissors near my son’s baby afro anytime soon though. I don’t foresee him needing a haircut for a loooonnnnggg time, thank goodness! Lucie’s last blog post..Motherhood Rant: Working Mothers Are Bad And Fathers Can’t Raise Children? DH cuts my hair unless I get a gift certificate from a student to use on a haircut. He usually does a better job than the professionals! 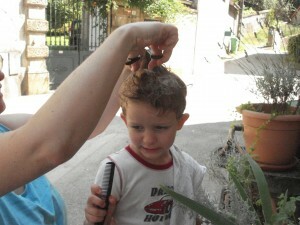 I cut the boys’ hair – DH included – unless the hubby’s on a roll and wants to do everyone’s hair! Judy’s last blog post..Thank GAWD Its Friday! Nice job! 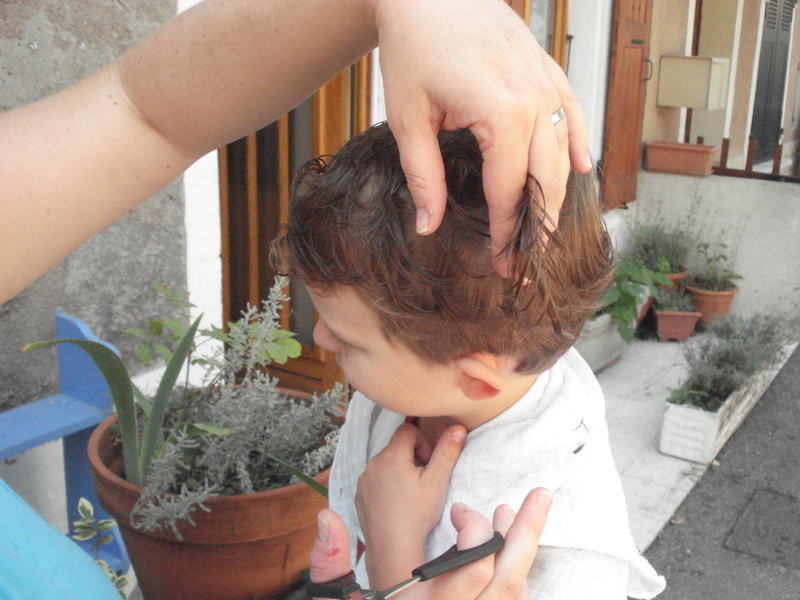 My little boy’s hair is curly like that, but he won’t let me brush it in the mornings, so I’ve started just giving him buzz cuts – now there’s an easy haircut! 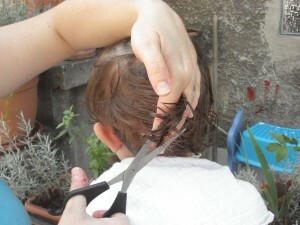 I normally cut my son’s hair and my husband’s hair. My husband grew up having only his mom cut his hair, so he was pretty insistent that I learn also. Sometimes my mother-in-law cuts mine (if our visits coordinate with when I need a trim) or a friend from church cuts it for just $10. Thanks everyone! 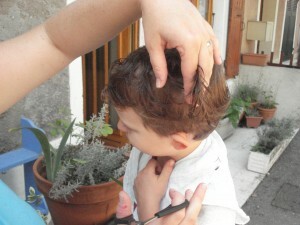 My other son’s hair is very fine and straight, quite unlike Owen’s, but I cut his too. He didn’t want a haircut this time around, however, so there are no pictures of him! I don’t brush either of their hair either, I consider it a daily victory if their teeth get brushed at least once. My boys get the “military cut” saves us hundred. I usually get my hair cut 3 times a year $15 each time. My daughter has long hair, all one length – so we only cut hers twice a year. This is one area that is easy for us to save money! I love the little curls on your boys hair – glad to see you didn’t cut all the curls off! great post! too bad my boy has “curly, coarse” hair so we do have to take him to get his hair cut every once in a while. Hubby doesn’t it about 75 percent of the time but with our type hair, you do need to go to a professional every once in a while to make sure its not on the verge of falling out lol. Amiyrah’s last blog post..Frugal and Family Lessons from "Jon and Kate Plus 8"
My last haircut involved my being sick of my double braids being so obviously uneven. I cut a little bit more off of the long braid than I needed to so I trimmed a little bit off of the short braid and voila! My hair was cut. It looks fine down too. I have coarse semi-curly hair that hides a multitude of sins. My husband and children on the other hand have hair that terrifies me. It obeys the law of gravity. I’ve tried cutting my daughter’s hair. She mostly just needs her bangs trimmed anyway. But wherever I cut it that’s where it stays. I cut my bangs at nearly the tip of my nose to account for springiness. If I cut her bangs at mid-eye, they stay right there in the middle of her eyes. It’s impossible to work with hair that holds still like that. So my son and daughter spend most of their time with their hair growing out and then if they feel like it they go with Daddy when he gets his hair cut. Your little boy is beautiful. I did try to do my sons hair once years ago with clippers. He ended up having a bald spot. I put too much oil in them. So never again. My daughter has never had a hair cut yet. She barely lets me brush or put a clip in it. Your post is very brave and inspiring to me. Kelly, that was such an adorable post!! I’ve always been mystified about how to cut hair. You make it seem easy (almost)! Your son’s curls are too cute! I’m confused. Wasn’t there supposed to be a bowl in there somewhere? In all seriousness, good job. 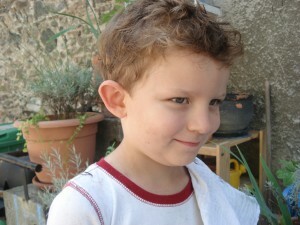 frugal zeitgeist’s last blog post..How do you teach kids to manage money? He is such a cutie pie! Good job on the cut. 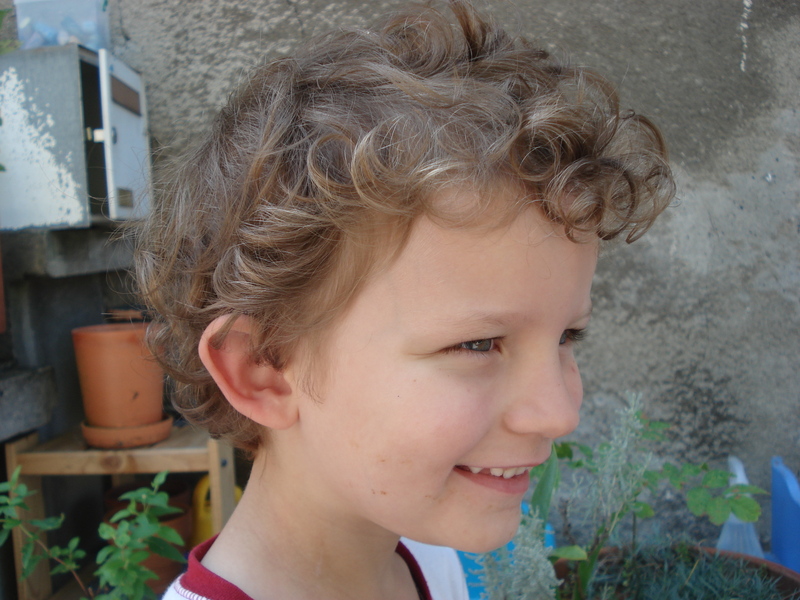 My son has massive curls, I end up taking him to the barber shop. Budget Mama’s last blog post..It’s signed and official!!! DS is getting ABA therapy for free!!! Great job! My wife has been cutting my hair for over 15 years and has saved us thousands of dollars. She now cuts our kid’s hair as well. In the last 15 years we have only had to replace one set of clippers and the total cost was $19.99. Great tutorial: Simple with great results. You have a great subject, too! If only I could get my wife to buy into this. I've been "threatening" a Flow-bee for years now!!! She thinks it's not a good haircut unless you spend at least $20, yet she still complains. 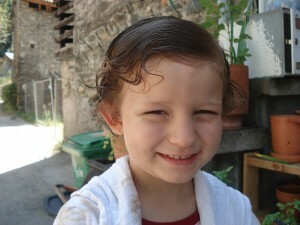 In fact, she rarely gets a "good haircut" even though spends at least 2x what I do for mine. My rationale for cheap haircuts is "hair grows." It's only a mistake for a few weeks. My next step: Kojak! Who loves ya, baby? I just cut my husband's hair last night! The first time or two I was nervous and not pleased with the results, but now I'm quick and and pretty good. He cuts my hair too – my dad taught him just after we got married 🙂 I think it's a lot easier to cut long (mine) than short (boys'/mens') hair. My dad always cut my hair; I only once got my hair cut by a professional, and it was horrible. At least with my dad doing it, I could have him trim up little spots here and there over the next few days until it was "just right"! I was looking for a simple plan to cut my sons hair. Looks like you’ve got it. Good job, I’m going to try it on my three year old now. He’s growing out his hair, and I’m just so used to doing the fade with the clippers…This should be interesting! Thanks so much for that, my 9yearold boy has very curly,thick hair and doesn’t like buzz cuts anymore,he has this long bit growing down infront,it touches his chin,last night he said bye to it so today I mite cut now that I’ve convinced him,Yay! He will be hansome 2. Great how-to explanation! I cut my husband and my son’s hair. I’ve cut my daughter’s hair once, and have cut my own a few times. For my daughter, who has curly hair, I found the book “Curly Girl” helpfull in how to cut curls. Too bad I read the book AFTER I had cut her hair. I’ll know how to handle it better next time, though. With my boys, if I mess up, I end up pulling out the clippers and buzzing it off. Most of the time it turns out well, though. I used your tips to cut my 2 year olds hair and it was great! These are great tips for someone like me who has a son who is scared of the barber. Thank you very much. I have searched and searched and finally there it was. These are great tips and I am going to try them on my 11 and 12 year old boys. Great job!!!!!!!! I just used your tips to cut my 18 month old twins’ hair, and they look great. You just saved my family so much money. THANKS! And your boys are so cute! .-= K8´s last blog ..Men may be the head of the household, but women have the neck. =-. Thanks a lot for this great advice. It was very well done. The photos help for those who are visual learners like myself. I’ve included a link to your article on my website, http://www.thewholeclip.com/, so that my visitors can also take advantage of your guidance. 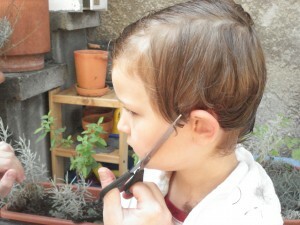 .-= James Cooper´s last blog ..Home Haircut Tips – 10 Indispensable Tips To Make Your First "At Home" Haircut A … =-. This is a great tutorial. Very well done. The photos help those who are visual learners, like myself. I’ve included a link to your article on my website so that my visitors can take advantage of your guidance. This is great we have a some blog on this topic too. I’m still not sure what to do with my little guys hair, so this helps. I liked he's hair beter when it was curly. But that is becuase my hair is also curly and my mother cuts my hair to. By the way my english is not perfect. Yes! I've decided while he is still little I'm letting my little guys hair grow. I'll cut the bangs but thats it. Daddy has no say because he doesn't cut hair around here. .-= Lisa´s last blog ..Hand Me Downs – Pay it Forward =-. I love your blog and the way you did Owen's haircut! He's so cute and sweet! Well, it looked easy enough , and he is so cute , my sons hair is blonde and has cowlick to the front and the crown so i did it now still have to take a trip to the Barber asap!! dont know what happened he is 4 and hates to sit for any lengthg of time , I was trying to fix an inital mess up by my mother UGH!!! well needless to say she should have never touched it , I would have got it done , and her husband is a barber , go figure , he just knows me and I am picky so he didnt want to touch it LOL!! Coming to this post rather late, but… Owen was a patient little lad to sit for a hair cut and photo session. Good-looking young man. 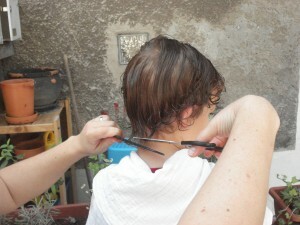 When my then husband-to-be and I were engaged I was shocked when he wanted ME to cut his hair. I tried to demur but he was insistent. I had no idea what I was doing but gamely took up a pair of scissors, and thankfully he was not too critical about the results. When you trim hair only every several weeks it takes a long time to truly learn how to do it. That first hair cut was over 37 years ago now, and at this point I am very comfortable cutting his hair and do a pretty nice job, if I do say so myself. His is curlier than Owen’s, I think, and he likes it a little shorter, but I use a very similar procedure. Thank you thank you thank you!!!! The last time I cut my little boys hair it was such a mess and I made bald spots! GASP! I am going to blog about this and link back to you. Again, thank you for the simple instructions and pictures. I copied and pasted to a Word document and took it to the bathroom with me. My husband read me your instructions step by step while my 2 year old sat in the sink and let me cut his hair! Yay! you have no idea how excited I am.